HELSINKI — Do dogs care if you smile? A study out of University of Helsinki’s Canine Mind research project finds that they do: especially when given “the trust hormone” oxytocin. In the recent experiment, researchers demonstrated that dogs given oxytocin pay more attention to smiling faces and find angry faces less threatening. A new study finds that dogs given oxytocin, “the trust hormone,” pay more attention to smiling faces and find angry faces less threatening. 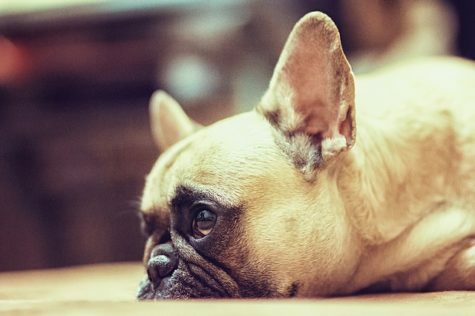 “It seems that the hormone oxytocin influences what the dog sees and how it experiences the thing it sees,” says doctoral student Sanni Somppi in a press release. To determine this, Somppi and fellow researchers enlisted the help of 43 dogs. Each dog was shown both smiling and angry faces on a screen — once without oxytocin, and once after being given a nasal dose of the hormone. Using advanced eye-tracking technology, the researchers recorded the dogs’ pupil size and where they looked. What they found was that dogs dosed with oxytocin lingered much longer over the smiling faces. They also found the hormone affected the pups’ emotional state, as evidenced by pupil dilation. With no dose of the hormone, the dogs’ pupils were largest when looking at the angry faces. Given oxytocin, this switched, and the dogs had the most dilation when looking at smiling faces. The researchers said that larger pupil size was correlated with an increased emotional reaction, which they said likely means that angry faces seemed less threatening under the influence of oxytocin and smiling faces were even more interesting. “We were among the first researchers in the world to use pupil measurements in the evaluation of dogs’ emotional states. This method had previously only been used on humans and apes,” adds the head of the research group Outi Vainio. 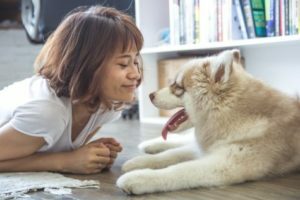 The experiment comes following other recent studies on canines and oxytocin, including research showing that dogs and wolves have a similar genetic variation that makes some more sensitive to the hormone. Scientists suggest it was wolves that had a sensitivity to oxytocin that were the first to become domesticated. The latest research by Vainio, Somppi, and their colleagues was published in a paper in the journal Frontiers in Psychology.